Electric Harp pours out psychedelic melodies over stylin' rhythms laced with soulful vocals. 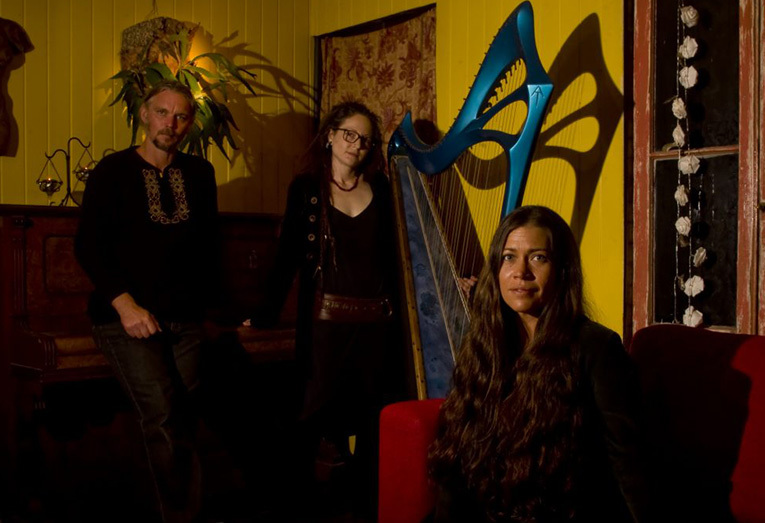 Folk funksters The Moonsets conjure up a lushly groovy, dark and sparkling, magical brew. Harpist Kayt Wallace immerses herself in 36 strings of Electric Harp, artfully bending the organic tones of this ancient instrument with classic guitar effects as her smoky vocals sweep from whispers to roars. Combined with the rich grooves of songwriting partner Stephan Beattie on Bass/Guitar and the playful rhythms of Andrea Joy Norden on skins, the trio make magic on stage. Acknowledged with highly commended 4 times in the Blues & Roots, Folk and World categories of the QLD Music Awards, it’s difficult to pin these musical adventurers down to one genre. Let’s just say The Moonsets create an exquisitely eclectic subtropical blend of psychedelic folk laced with soul funk, blues, jazz and a splash of reggae but be prepared to have your preconceptions blown in the best possible way.